We love connecting with like-minded organisations, who care about our environmental impact as much as we do. 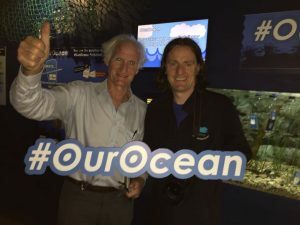 We were approached by Galway Atlantaquaria, to get involved with their #OurOcean project, and of course we jumped at the chance! The exhibit was officially launched by the EU Commissioner for Environment, Maritime Affairs and Fisheries Karmenu Vella, on the 29th of June. It’s truly engaging and informative, highlighting a number of Marine litter issues. 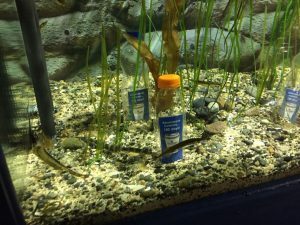 In order to visually convey the lasting damage that litter causes to our oceans and marine life, the idea came about to fill a tank with different items of long-lasting plastic and gauge the visitor’s reaction to seeing them at the bottom of the ocean (or the tank in this case!). Each item would be labelled with the amount of time it takes for it to decompose, in most cases this would have been hundreds of years. Aside from confronting the problem of plastic pollution head-on during the exhibit, we also wanted to collectively offer a solution, a viable alternative to plastics. Enter compostable packaging! In stark contrast, our compostable items biodegrade in under 12 weeks, when commercially composted. Visitors to the exhibit were taken aback by the length of time plastic items take to decompose. 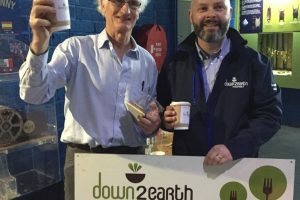 Some were even unaware that compostables existed, and that they’re readily available to all food businesses, as a responsible alternative to single-use plastics. It is our hope that this collective world exhibit will start a conversation about Ocean pollution. Most importantly, we aim to encourage people to DEMAND compostable packaging and materials from their local food businesses. Duncan Stewart of Eco EYE paid a visit during launch day, he was thrilled to have gotten the chance to see the visuals for himself. “I am inspired by the exhibit #OurOcean at Galway Atlantaquaria! It’s clear that plastic is causing devastating damage to marine series and ecosystems. We need to stop buying products wrapped in plastic or single-use disposable containers. 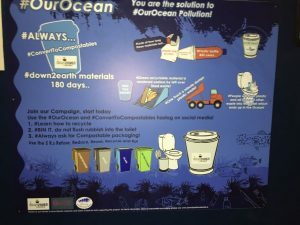 Citizens need to come together collectively, ‘name and shame’ the producers of products and drinks that continue to use plastic, when Down2Earth Materials produce compostable options. We need to focus on protecting our children’s future”. 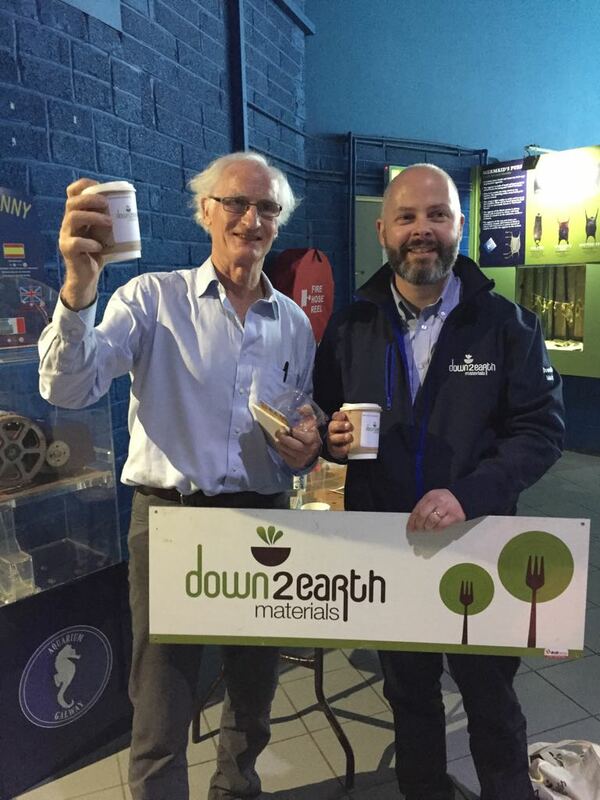 We were quite chuffed that Duncan had such positive things to say, particularly about our own compostables as a viable alternative nationwide. Plastic is the most common element that is found in the ocean. It is harmful for the environment as it does not break down easily and is often considered food by marine animals. Plastic debris can absorb toxic chemicals from ocean pollution, therefore poisoning whatever eats it. In fact, plastic pollution is one of the biggest killers of marine animals. Plastic does not degrade; instead, it breaks down into progressively smaller pieces, but never disappears. They then attract more debris. It poses a significant health threat to the various sea creatures, and to the entire marine ecosystem. 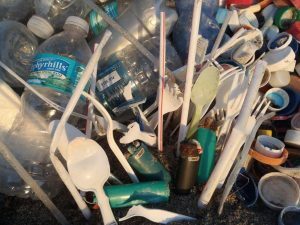 Overall, plastic is the number one source of pollution in the ocean. If you have any comments about the exhibit, please contact [email protected] directly.